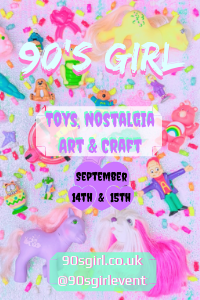 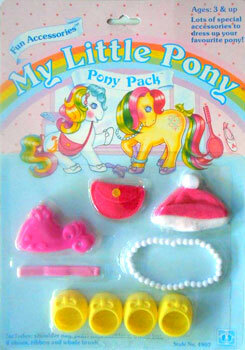 MLP Year 5 had twelve new sets of ponies and four sets of special offer ponies. 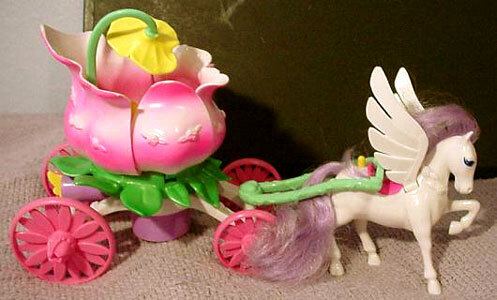 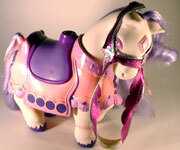 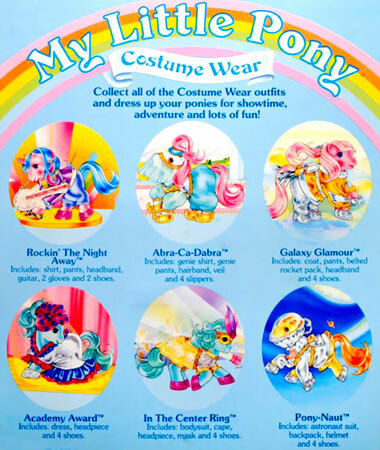 There were three new playsets, one new accessory and four new sets of pony wear. 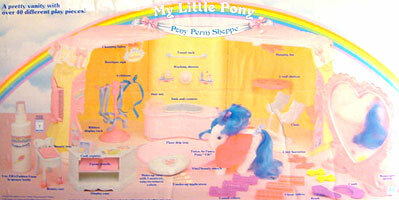 "A fashionable beauty salon with working shower and over 40 accessories for styling ponies hair. 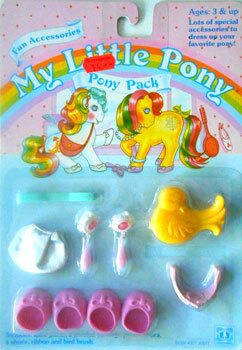 Easy to use, nontoxic styling solution sets ponies' hair in 10 minutes without heat for fast, glamorous hairstyles!" 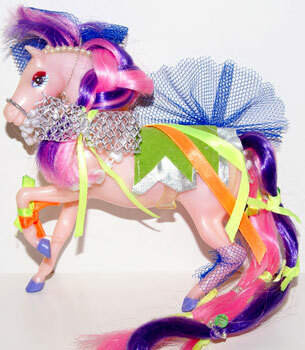 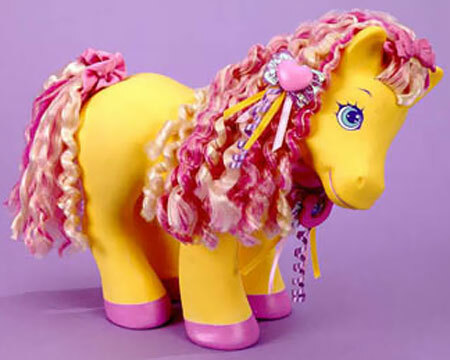 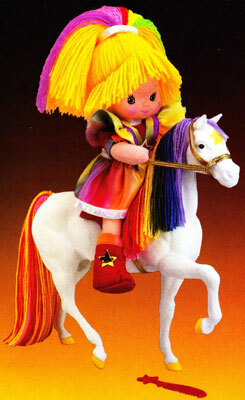 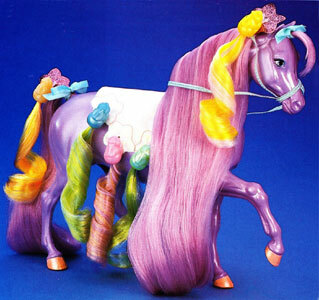 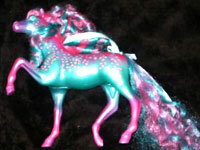 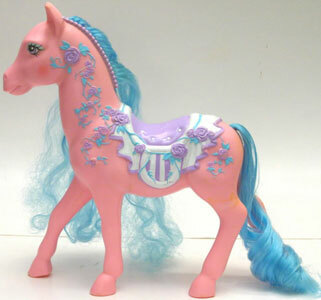 The Perm Shoppe came with one adult pony Fifi who was a Twice As Fancy pony. 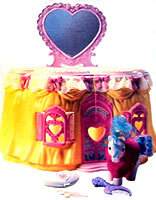 When closed it looked like a dressing table, when opened it became a hair salon with working shower and over forty beauty salon accessories. 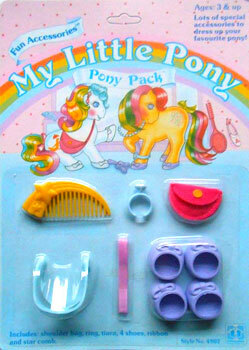 In the UK this set was called the Crimp 'n Curl Hair Salon, but was also called the Curl and Twirl Perm Salon in some UK inserts. 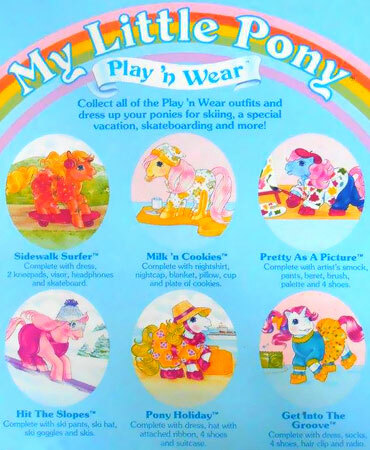 "Here's the place where the ponies get together for some beachy-keen snacks. 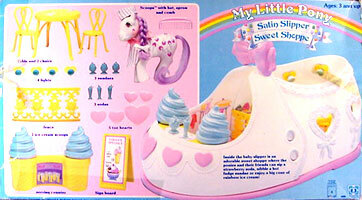 Slipper-shaped Ice Cream shop comes with Scoops, furniture and accessories for lots of delicious fun!" 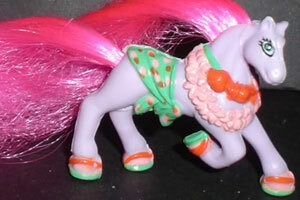 The Satin Slipper Sweet Shoppe came with one adult pony Scoops who was a Twice As Fancy pony. 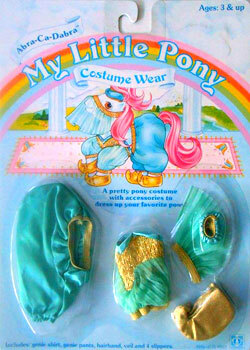 When closed it looked like a ballet slipper and could be carried by the pink bow on top. 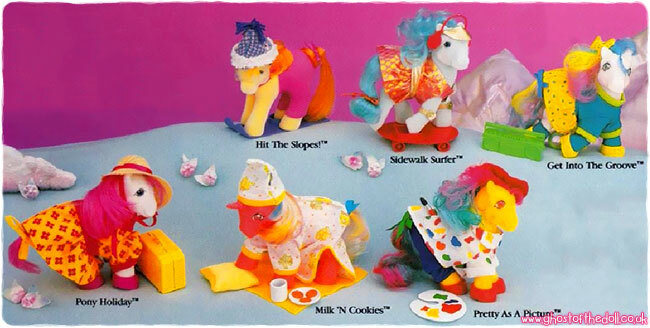 When opened, it become a soda fountain and ice cream parlour. 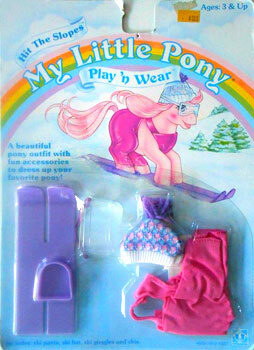 This playset was not sold in the UK. 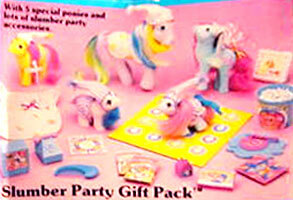 The Slumber Party Gift Pack was similar in idea to Year 4's Party Gift Pack. 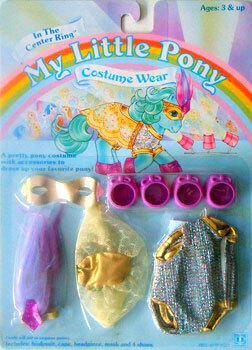 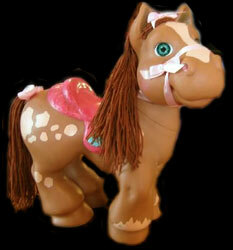 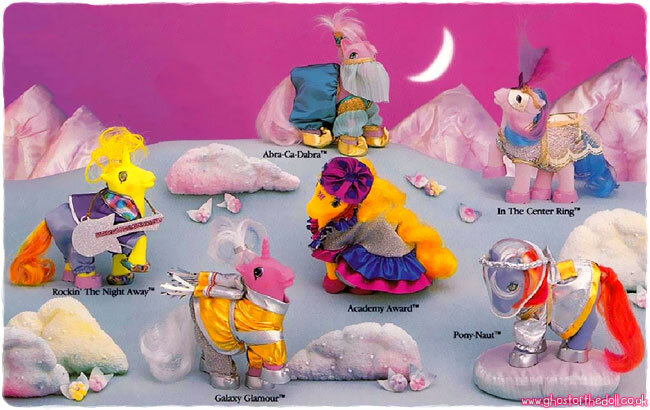 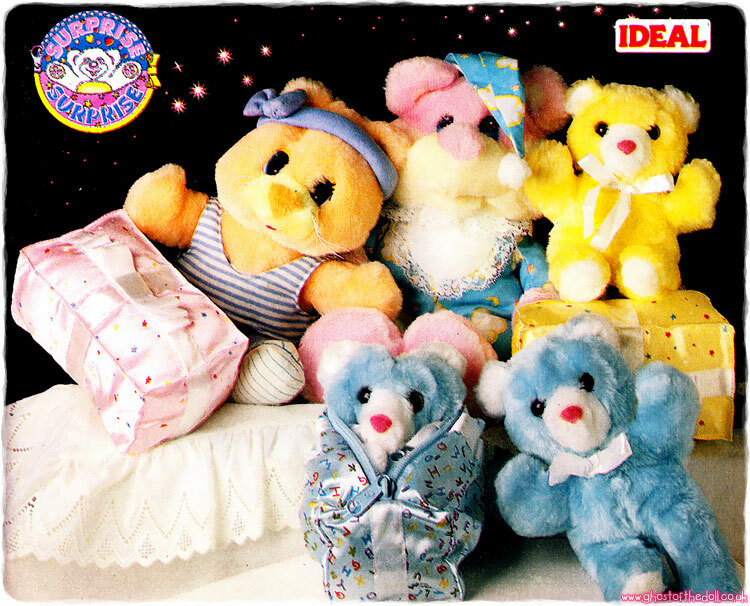 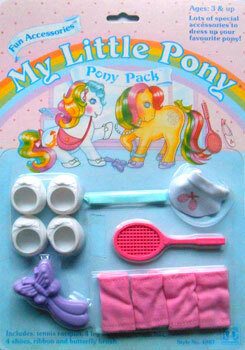 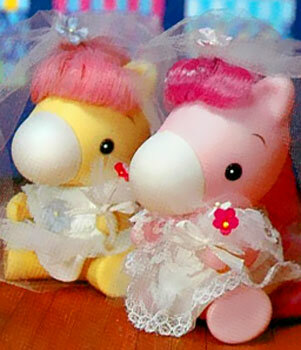 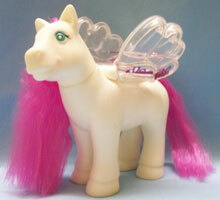 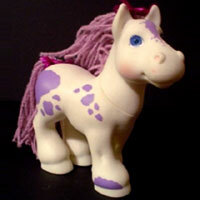 The set included five new ponies, and each one came with their own nightcap, comb and hair ribbon. 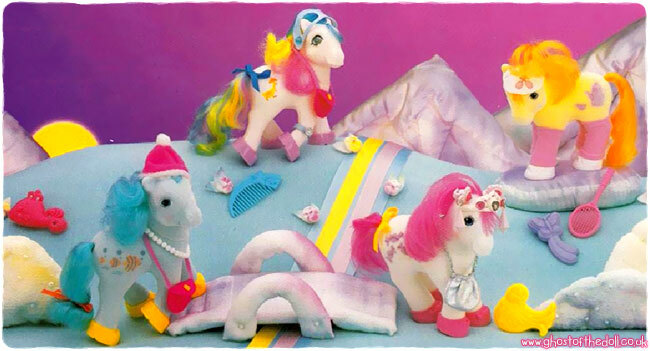 There were many other accessories including sleeping bag, tub of popcorn, box of cookies, cloud-shaped record player, phone, television, milk carton, two magazines ("Teen" and "Screen") and "Rainbow Hop" game with multi-coloured board, spinner & instructions. 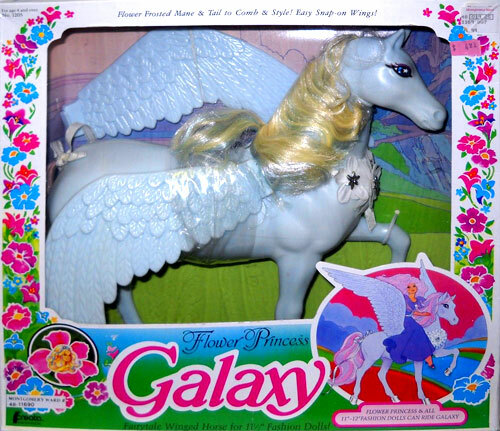 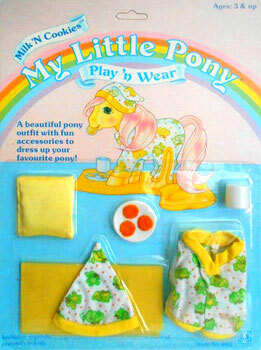 Although this playset was not sold in the UK, some ponies (but no accessories) did become available, most probably after US production had ceased around Year 10. 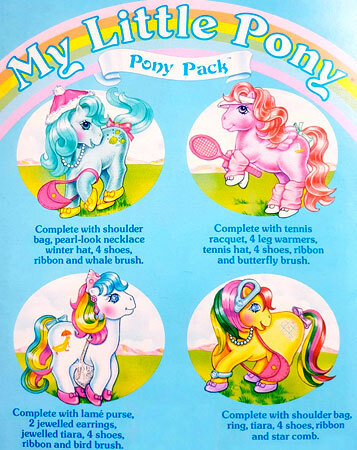 The only accessory produced in Year 5 was the Pony Purse. 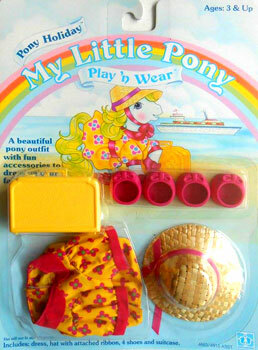 Like Year 4's Pony Purse, it was made for carrying Ponies and their accessories. 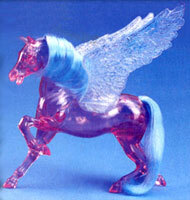 The design was slightly different but still had the same features. 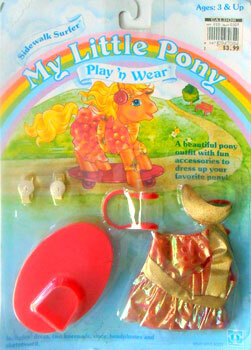 The Pony Purse came with it's very own baby pony, Baby Crumpet, a First Tooth Baby Pony. 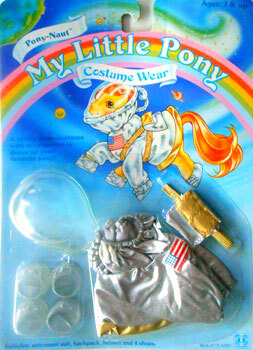 This accessory was not sold in the UK. 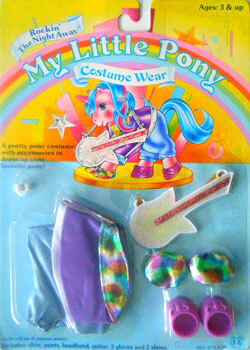 There were four new sets of Pony Wear produced in Year 5. 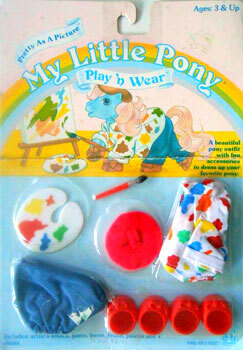 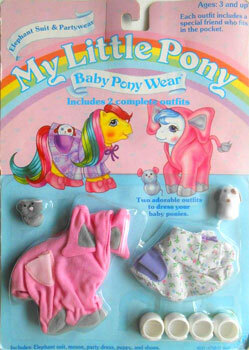 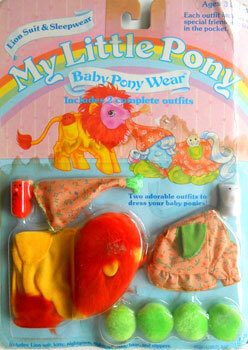 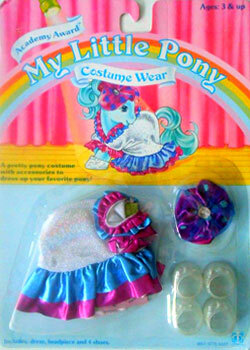 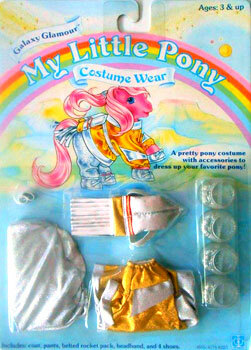 Two new pairs of Baby Pony Wear With Pocket Pals were added to the first set from Year 4. 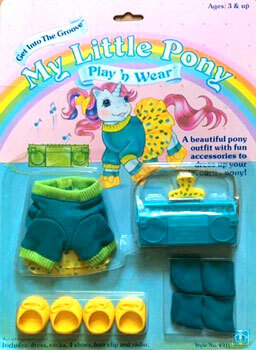 As before, each outfit came with its own little pal.